Despite the acknowledged health hazards of lead in drinking water, Australian homes and workplaces continue to be blighted by this scourge, mostly via lead leached from brass tapware and related fittings. John Power reports. Lead is a neurotoxic metal that causes lifelong debilitating eﬀects, and yet its presence in Australian household drinking water is widespread. While there is clear evidence dating back many decades of a massive problem, the precise extent of the hazard is unknown, as (incredibly) there are no systematised water testing processes at the customer side of street mains to produce comprehensive data on the subject. There are no ‘safe’ levels of lead ingestion; worryingly, lead is most harmful to humans at the developmental stages of childhood. 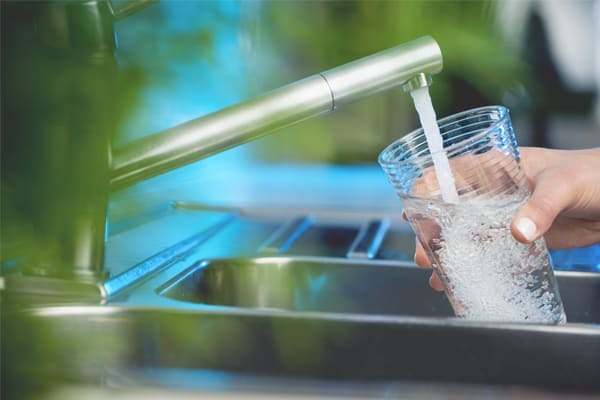 In this article we’ll examine the current regulatory frameworks designed to protect Australians from exposure to harmful levels of lead in household drinking water, and attempt to identify weaknesses in the methodologies, applications and enforcement processes underpinning these regulations. Finally, we’ll address ideas – some of them radical – to overcome this problem in the interests of community health. Last year, two signiﬁcant events shone a spotlight on unsafe lead levels in potable water: the ﬁrst was a Macquarie University study that, for the ﬁrst time, tested lead levels in water consumed in a broad cross-section of homes in New South Wales. Tests involved the sampling of ﬁrst-draw water in the morning, when water had been in contact with ﬁttings overnight. The study involved the sampling of potable water drawn from the kitchen taps of 212 homes across the entire State, and detected lead in 56% of samples; some 8% of the total test samples exceeded recommended lead thresholds of 0.01mg/L of water, as stipulated in the Federal Government-approved advisory document Australian Drinking Water Guidelines. A straightforward extrapolation of the ﬁndings at a national scale, based on Australia’s nine million dwellings, equates to approximately 720,000 households with unsafe levels of lead in their drinking water. Importantly, the study provides scientiﬁc evidence that, notwithstanding possible additional, alternative or zonal lead contamination from roof ﬂashing, pumps, water tanks, pipework, tainted soil, etc, the primary problem can be attributed to lead leaching from tapware and associated ﬁttings: ‘The case studies (Phase 2) show that the likely source of drinking water lead contamination is the components within the internal property plumbing,’ the study report states. NB: there is no suggestion that elevated lead levels in water can be blamed on civic water supply lines, which are monitored routinely for purity and safety. The problem, it is worth repeating, lies with plumbing systems within homes, with the worst culprits in the Macquarie study being taps less than one year old. The second event was the announcement that the newly constructed Perth Children’s Hospital could not open due to the detection of unsafe lead levels in the building’s drinking water. At the time of going to print the hospital remains closed, and the source of the contamination has not been identiﬁed. Both of these events have highlighted an unacceptable public and professional ignorance of the prevalence of high lead content in the drinking water of buildings, reminding the plumbing industry in the most painful fashion that a problem ignored is not a problem solved. At present there are no systematised checks of lead levels in water (drawn from the tap) in Australian buildings. This observation forms a good starting point for the obvious question: What checks and balances, if any, do exist to tackle the issue of lead in drinking water? On the face of it, formal regulatory frameworks would appear to be robust and comprehensive. All plumbing products that come into contact with potable water must be certiﬁed under Australia’s national mandatory WaterMark scheme, which itself requires compliance with a range of supposedly rigorous quality assurance protocols and laboratory checks deﬁned under relevant Standards such as AS/NZS 4020 and AS 3718. Products that adhere to full WaterMark provisions and constituent standards ‘to the letter’ should release sub-threshold levels of lead (<0.01mg/L in normal circumstances and conditions). Nevertheless, the presence of lead in Perth Children’s Hospital, combined with the disturbing ﬁndings of the abovementioned study and previous smaller studies, demonstrate that current quality assurance processes are far from bulletproof. So, where are current systems breaking down? Non-WaterMarked products, manufactured and imported without any WaterMark certiﬁcation whatsoever, may be sold legally in Australia – though the installation of such products is not permitted. In fact, a plumber can be charged for installing a non-compliant product, even if another party actually sourced the product. While such potentially non-compliant products are freely available in mainstream stores and via online retail portals, the true extent of their use in Australian homes is unknown. By all accounts the Water Eﬃciency Labelling Scheme (WELS) regulator says it is actively pursuing online and retail miscreants. Nevertheless, it would be ludicrous to suggest that all problematic ﬁttings are non-WaterMarked items, clandestinely installed by lawless plumbers or consumers. On the contrary, common sense indicates that signiﬁ cant numbers of WaterMarked products are responsible for a proportion of excessive lead leaching from tapware. The WaterMark certiﬁ cation process itself, which is administered by the Australian Building Codes Board (ABCB) and implemented through a number of Conformity Assessment Bodies (CABs), as approved by JAS-ANZ (Joint Accreditation System of Australia and New Zealand), contains innate procedural weaknesses, according to a number of industry professionals. Product certiﬁcation under the WaterMark scheme, which is currently subject to revision (updated version due for release 1 July 2017), is essentially a materialsbased assessment based on submitted sample products and accompanying scientiﬁc test reports, followed by supposed scrutiny of products via ongoing sampling, as well as annual examinations of manufacturing premises and processes (shortly to become ﬁ ve-year intervals under the revised version). However, following initial certiﬁcation, a number of variables can aﬀect the integrity of subsequent product batches or even permanent production runs, rapidly diminishing the value of the certiﬁcation. These variables include (a) changes to the supply chain, aﬀecting the quality or type of raw materials used during manufacturing processes; (b) substandard or erratic process control within the factory; (c) questionable test reports (many with a ﬁve-year validity), which may bear little relevance to evolving product characteristics in the market; and (d) inadequate or insuﬃciently regular (unpublished) product sampling and assessment. These concerns may have been less pressing generations ago when there was a higher level of local manufacturing activity, as supported by entrenched, linear and transparent supply chains. These days, however, there are some Australian supply companies who have never even seen the oﬀ shore facilities where their products are made, and who have scant understanding of the complex, dynamic and remote supply chains that service them. Richard Michaels, the managing director of Zetco Group and the president of the Plumbing Products Industry Group (PPIG), says WaterMark certiﬁcation should deﬁnitely be more robust to help curtail excessive lead levels in ﬁttings. “When a manufacturer submits a product for testing there is no doubt in my mind the product will meet all the [WaterMark] requirements – it’s what happens afterwards that is the issue,” Richard says. For example, Richard says the use of Dezinciﬁ cation Resistant (DZR) brass, which is recommended for brass used to manufacture high-quality tap ﬁ ttings, is visually indistinguishable from non-DZR material. In the absence of regular product testing, it is tempting for unscrupulous manufacturers to use non-DZR brass, which is (a) cheaper to purchase, (b) easier to machine or hot press and (c) provides 15%–20% more hits in a die (i.e. signiﬁ cantly larger production runs) compared with more resilient DZR brass, which is much harder on tools. “Over the years we have come across brass in 3” valves made by our competitors – and the brass wasn’t DZR!” Another practical factor to consider, Richard notes, is that new brass supplies are typically composed of a mixture of virgin material and scrap. It is therefore important that the quality of the brass scrap be monitored by the manufacturing organization to ensure lead content does not exceed the required levels. As a quality control measure during manufacture, DZR brass swarf is not supposed to be intermixed with non-DZR brass swarf. “And we have had cases where products coming in from our neighbours to the north have had far too much lead in them because they have bought very bad scrap or their controls are very poor,” Richard explains. Further, he says mechanisms designed to monitor and ensure premium factory processes are hardly reliable: “In order to get a WaterMark a factory has to get ISO 9000 accreditation,” he explains. While these kinds of day-to-day instances of WaterMark breaches are alarming, there are some critics who say the entire certiﬁcation and regulation system needs reworking. Elizabeth O’Brien is the co-founder and president of the registered charity organisation The Lead Education & Abatement Design Group (aka The LEAD Group). She has been campaigning for a lead-free living environment for almost 30 years. Her voluntary eﬀ orts have been directly instrumental in the removal of lead petrol and paint, for example, from the Australian market, and her work has been recognised with a United Nations Association of Australia Award for Outstanding Service to the Environment. According to Elizabeth, any domestic assessment of water quality must commence with an examination of what comes out of the tap, rather than relying on stand-alone product-based certiﬁcations. “At present there is no requirement on anybody to test water at the tap, and there should be,” Elizabeth says. Further, Elizabeth says existing WaterMark certiﬁcations lack credibility because they fail to address ‘full system’ plumbing installations. In other words, ﬁttings or components that receive certiﬁcation ‘individually’ might breach water quality guidelines when installed collectively as a system. Metropolis Solutions director and forensic plumber Russell Kirkwood agrees that this concern is legitimate, particularly in relation to larger buildings, where lead concentrations in ﬁttings become elevated overnight, in particular, due to prolonged contact between still water and surrounding ﬁttings. This point reinforces the dangers of using ﬁrstdraw water in the morning, as noted above in relation to the Macquarie University study. NB: thorough ﬂushing is by no means a panacea, and cannot be relied upon to mitigate lead leaching in all circumstances. “In larger apartment blocks you have a lot more water sitting in the building than you do in a single house,” he says. “So, if you have an apartment block with 90 premises in it – and I went to one the other day in Docklands [Melbourne] with 460 – there’s a lot of water just sitting there in that building in contact with whatever brassware the plumbers have put into that building. Given the diﬃculties of assessing ‘full system’ plumbing installations, Elizabeth says the only logical solution is to reduce the amount of lead in ﬁttings “to undetectable levels”. She believes the ADWG threshold of 0.01mg/L is too high, and should be reduced by a factor of 10 to 0.001mg/L. This call would appear to be feasible in practice based on the ﬁndings of the Macquarie University study, which recorded average detectable lead content levels in tested ﬁttings of 2.84%, roughly 10 times the permitted levels in the US. Since January 2014, American regulations have stipulated that lead content of ﬁttings in contact with potable water must not exceed 0.25%. If the Americans can produce low-lead ﬁttings, then surely we can do the same. In fact, both Elizabeth and Russell agree that our local plumbing industry’s goal should be non-detectable lead levels in all plumbing ﬁttings. Australia’s regulatory systems have a long history of adopting US models. As discussed above, the new benchmark of 0.25% maximal lead content in plumbing ﬁttings contacting potable water now applies in all US States. The same policy could be enacted in Australia as a means of minimising primary lead exposure ‘at the source’, much as lead removal from paint and petrol simpliﬁed the challenge of cleaning up those industries. While much of this article has focused on ways of tightening WaterMark-certiﬁed product, we must not forget the presence of non-WaterMarked product in the marketplace, which should be banned outright. There are few realistic uses for kitchen or bathroom taps in non-potable applications, so the presence of such non-WaterMarked product in the marketplace has no commercial justiﬁcation. As Richard Michaels notes, the burden of obtaining compliant product currently rests on the shoulders of plumbers, who are required to discern and reject non-WaterMarked products at the point of sale. “We want POS legislation to apply to WaterMarked product so the requirement for selling [only] WaterMarked products comes back to the retailer,” he says. Master Plumbers and Gasﬁtters Association (WA) chief executive Murray Thomas says removal of non-compliant product would greatly assist law-abiding manufacturers, installers and end users. “Industry is advocating strongly for consistency across all the products our retailers oﬀ er to consumers,” Murray says. “At the moment this doesn’t happen. “The playing ﬁ eld needs leveling to outlaw any retailers selling untested and inferior products at a lower price. “Alarmingly, we’ve started to see an emergence of issues where drinking water is being contaminated because of products used that do not carry the Australian Watermark. “It is all about protecting consumers. “The threat of lead poisoning is heightened if products are not being tested to ensure compliance with our current regulatory standards. “Consumers simply should not be able to go into a hardware store and buy a $20 sink mixer that is non-compliant. “The industry, for the sake of all Australians, needs a level playing ﬁeld where all products are tested to meet the compliance standards and can only be sold if they do so. At present there are elaborate ‘sign oﬀ ’ procedures designed to ensure quality control of major structural elements of newly constructed buildings. These procedures could be expanded to include mandatory testing of lead content in water, which means lead levels could be checked as a formal part of the handover of all new buildings. Alternatively, the process might be limited to representative samples of buildings, or to speciﬁc structures like schools, kindergartens or healthcare facilities accommodating children. Selective, random tests of the lead content in the water of existing Australian buildings could become accepted policy as a means of identifying non-compliant older ﬁttings or problematic ‘full system’ applications leading to lead contamination. Russell suggests that this kind of testing could be incorporated into regular examinations, for example, of thermostatic mixing valves and backﬂow prevention devices. Comprehensive testing of the water quality in existing buildings could also help reﬁne our understanding of baseline metrics in relation to a range of issues, including the presence of zonal hotspots, trends of elevated lead levels linked to speciﬁc product models or suppliers, as well as ﬂuctuating lead levels based on geopolitical boundaries. There are no solid data for such important issues at present, which critics like Elizabeth O’Brien say is amazing in the 21st Century. At the moment State-based authorities have the power to enforce the correct installation of WaterMark-certiﬁed products. For instance, in 2015 the Building Services Board in WA ﬁned the building company Choi Homes Pty Ltd for installing non-WaterMarked plumbing ﬁttings in a 13-unit complex. But what penalty regimes apply to manufacturers or suppliers who produce non-compliant products in the ﬁrst place? The severest threat seems to be withdrawal of Watermark certiﬁcation, which is a commercial penalty; but one might argue that such a penalty is both misdirected and inadequate in light of the serious health hazards pertaining to lead contamination. Surely the manufacture of ﬁttings that leach lead above permitted levels should be regarded as a breach of health department regulations. Such regulations (through instruments like The Food Act 2008) are applied by third-party agencies including municipal councils, and result in prosecution through local courts. Convicted oﬀenders are named on a web-based register. This process establishes an arm’s length between the codesetting body or certiﬁer and the enforcement agency, removing any perceived conﬂict of interest between the fee-collecting code administrator/certiﬁer and the ﬁne-paying oﬀender. One of the major arguments against pervasive sampling of plumbing ﬁttings is excessive cost: full laboratory tests can cost up to $15,000 and take several months to complete. Fortunately, as far as lead contamination is concerned, there are aﬀordable alternatives. In simple terms, a systematised process of random $100 water tests to determine lead content in household water would suﬃce to identify whether or not a problem existed in a given household or public building. An ‘all clear’ result would be a welcome end to each enquiry. On the other hand, detection of unsafe lead levels could kickstart an appropriate examination of relevant ﬁttings and conduits, delineating a clear pathway to identify chronically oﬀ ending manufacturers or system types. In the meantime, plumbers wishing to perform their own lead content water tests can obtain aﬀordable test kits from The LEAD Group in NSW – see the previous page for an overview of these test kits and pricing. Thankfully, home owners and plumbing professionals already have discretion to use ‘lead free’ devices (this may mean ‘non-detectable’ levels of lead) for peace of mind. Such products consist of stainless steel or specialised proprietary brassware and are generally more expensive than conventional ﬁttings, but they are certainly recommended by organisations such as The LEAD Group. Elizabeth says companies like the stainless steel tapware company Vinco have shown solid support for the group’s activities, and she invites other likeminded advocates of lead-free plumbing to become members of Lead Safe World, a LEAD Group initiative championing lead-free products. Vinco Architectural Hardware oﬃce coordinator Steve Virag says Vinco’s decision to supply lead-free tapware recognised the tightening of regulations in the US and Europe relating to lead in drinking water. Moreover, Steve says the wider industry should be bound by stricter controls to reduce the public’s exposure to lead. “I feel we deﬁnitely need to be policing the current Standards, as studies show the evidence is becoming more prominent and a major concern for all Australian households,” he says. Another proud advocate of safe plumbing products is Methven. Methven general manager – marketing and customer experience Laura Keogh says Methven uses a product called Eco Brass® in the company’s Aio and new Surface tapware ranges. Eco Brass, Laura explains, is a revolutionary, high-quality, high-strength material that is lead- and heavy metal-free (less than 0.2% lead), which is equivalent in strength to stainless steel 303 grade, and exhibits the highest strength of any wrought copper alloy. The presence of lead in Australian drinking water is beyond an anomaly – it is the predictable outcome of distribution practices that prioritise the needs of the manufacturer/retailer over the consumer, and which favour expedience over regulatory strictness as competitors race to reach the lowest possible price point. That goal, the study notes, was written in 1993, and nothing has improved since then. The plumbing industry would be wise to seek government funding to conduct a baseline study along similar lines to the Macquarie University study, but on a national level.